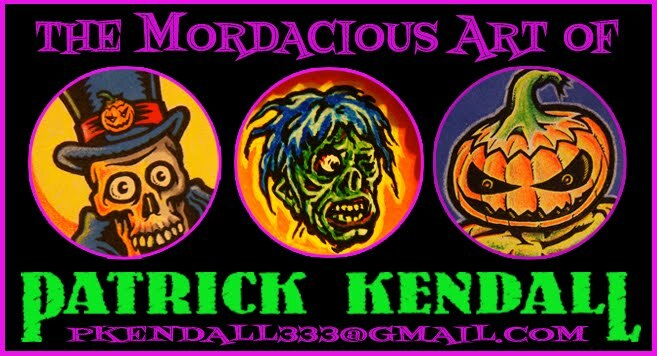 THE MORDACIOUS ART Of Patrick Kendall: DEAD... OR ALIVE? Just a quick post for all of my blogging friends that take the time to stop by my blog... No, I am not dead- a couple series of setbacks has caused a delay in my blogging activity. First, the hard drive in my Powerbook G4 did indeed die... Leaving me in a state of panic as all of my digital creations were on there. Thanks to the IS guys at my job, my art was rescued from a permanent death. Just another keen reminder to always back up your stuff. Never had to worry about that with traditional artwork!! Second, they have been cracking down on us spending too much time on the internet at work, so my blogging time has been reduced to virtually nothing. I will continue to post art and I will do my best to check out the work of everyone else. You guys inspire me daily, and I won't let anything prevent me from dipping into that inspiring well! I have a really cool digital piece that I have been working on in Photoshop that is near completion, and I will be posting it here soon. Thanks for all your patience, and keep on inspiring!! See ya soon! !